The perfect diesel-pusher experience begins starts with a solid base, and Winnebago’s exclusive Maxum Chassis provides the ultimate framework for an unsurpassed ride in a Class A Diesel motorhome. Winnebago’s engineers worked closely with Freightliner Custom Chassis – the proven leader in diesel motorhome chassis – to create the Maxum Chassis: a stronger, better performing chassis. The Maxum Chassis sets the standard for diesel-pusher chassis with its lowered-rail frame providing better handling, a smoother ride, and incredible strength. In fact, the Maxum Chassis is seven times stronger than a raised-rail chassis which minimizes chassis flex and twisting. To top it off, the Maxum Chassis’ lowered-rail design increases the basement storage height allowing for pass-thru storage with room for slideout trays. In conjunction with the exclusive Maxum Chassis, Winnebago offers Freightliner Custom Chassis’ V-Ride single axle suspension rated at 24,000-lbs. Freightliner Custom Chassis V-Ride is designed for luxury motorhome owners who want the ability to carry more gear, the freedom to equip their interiors with premium amenities, and a comfortable, confident driving experience. 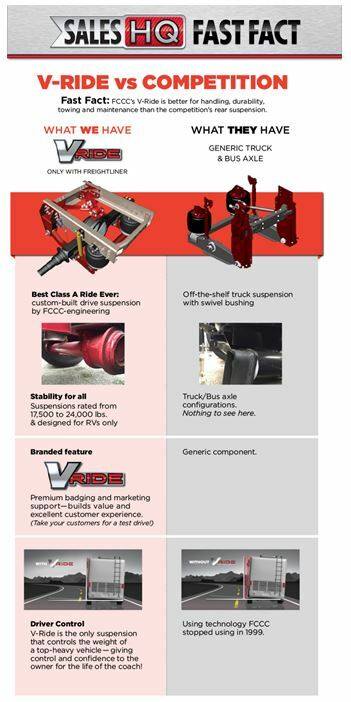 FCCC’s V-Ride is the only suspension that controls the weight of a top-heavy vehicle – giving control and confidence to the owner for the life of the coach. Competition is still using technology that FCCC stopped using in 1999. All motorhomes built on the Freightliner Custom Chassis – including the Maxum Chassis – qualify for Winnebago’s Carefree Diesel Living warranty. This program extends the Winnebago warranty on our diesel pusher lineup — all built on Freightliner chassis — to an industry-leading 3 years or 100,000 miles, whichever comes first. Confident and bold, the Winnebago Horizon brings a fresh look to the diesel pusher category, with the performance to back it up. Each of the Horizon floorplans feature a refreshingly clean design, highlighted by LED tube lighting and luxurious Villa furnishings. Both include a spacious master bedroom with an available walk-around recline/incline king bed, abundant interior storage, full galley with residential-style refrigerator, and the versatile Glide & Dine dining table and chairs that let you configure your dining area to suit your needs. Every Horizon is built on our turbo-diesel-powered Maxum Chassis, so you can count on the performance, ride, handling, and storage to match the Horizon’s elegant good looks. Drive, arrive, and thrive in style: the new Horizon is calling. The Winnebago Horizon 42Q features a mid-coach guest bath, dedicated lounge area, and private master suite make the 42Q ideal for entertaining — or getting away from it all. WATCH THE FACEBOOK LIVE VIDEO TOURING THE ALL NEW HORIZON 42Q & FORZA 38F HERE. Drive your Horizon worry-free with Winnebago’s 3-year/100,000-mile Carefree Diesel Living warranty. See Lichtsinn RV’s Winnebago Horizon Inventory here. Winnebago Product Manager Ryan Roske and Product Planner Nick Davis tour the Winnebago Horizon 42Q floorplan and Forza 38F floorplan live from Winnebago’s Open House. See Lichtsinn RV’s Winnebago Horizon inventory here and our Forza inventory here.